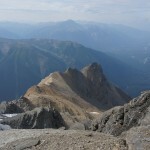 At 12,972 feet, Robson is by far the highest peak in the Canadian Rockies. Not only is it tall, but it is far north and close to the wetter western edge of the range. 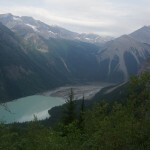 Its massive south face, rising 10,000 feet from Kinney Lake, dwarfs what would ordinarily be a decent-sized body of water. Most people climb the Kain Face, around on the north side of the mountain. 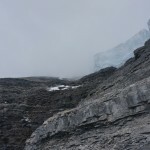 Though it sounds like a fun route, it is not suitable to me as a day-hiker for two reasons: first, the approach is a long hike around the mountain to Berg Lake; second, it requires crossing the Mousetrap Icefall, a crevasse maze I would prefer not to solo. Instead, I chose a less interesting but more direct route up the south face. The math doesn’t lie: by its shortest route, Robson is 10,000 feet of gain and less than 20 miles, so it is a reasonable dayhike, probably under 12 hours for a fast person with perfect conditions. However, as I found, in worse conditions it can easily become more serious. After spending a day in a café in Jasper, staring in frustration at perfect conditions on the Robson webcam, I drove over to the Berg Lake trailhead to prepare my gear. With Robson’s reputation as a Serious Mountain, and a questionable forecast for the next day, I went in heavy: mountain boots, real crampons, two tools, softshell outer layer. This was not to be a fast-and-light outing. Waking at 4:30, I prepared by headlamp and set out at 5:00, stowing the headlamp about 20 minutes up the trail. I looked at the sky, but could not tell if it was overcast or not in the strange light of a northern dawn. 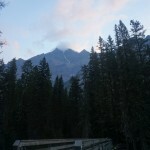 Reaching Kinney Lake, I followed the trail to where the hiker and horse trails split, then backtracked to the bridge, worried that I had missed an obvious climbers’ trail. 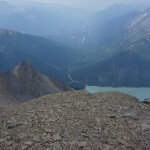 Not finding one, I returned to the horse trail, then headed up a gravelly gully toward Robson’s south face. 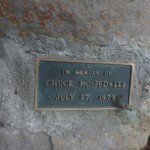 Glancing right, I happened to see some orange tape and a cairn, and lucked onto the climbers’ trail, which starts near a memorial plaque. I found the approach much like that to the southern Pickets: a few miles along a nearly-flat road, then a few thousand feet straight up through the woods on a brushy climbers’ trail. The difference, of course, is that once you emerge from the trees in the Pickets, you’re faced with several snack-sized spires. On Robson, you’re at the base of a 5,000-foot glaciated talus-monster. I briefly lost track of the trail where it follows the base of a rock band, then noticed a couple of fixed hand-lines that would prove useful on the way down. 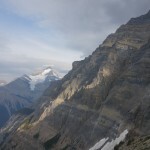 Finally emerging from the woods, I lost the trail in a broad talus slope, climbing too high and eventually scrambling to the ridge near its lowpoint southwest of the Forster Hut. 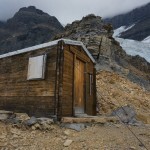 Passing a nice bivy site, I followed cairns and bits of trail to the hut, which was in excellent condition. 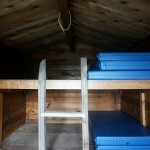 Inside were a stack of a half-dozen thick air mattresses on two wide bunks, along with a box containing spare fuel canisters and the necessary cleaning products for cohabitation with rodents. 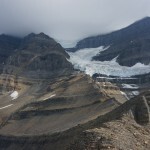 I stopped for a snack, then followed the cairns and flags up the obvious ridge next to a decent-sized glacier. 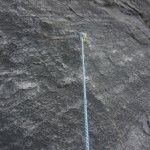 The climbing was all class 2-3, with many possible routes. Though the upper mountain was still cloud-capped, clear skies to the south and west held out hope that conditions might improve. 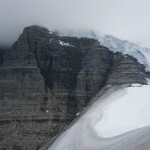 The peak of the ridge is separated from the upper south face by a short glacier col. This late in the season it was bare ice, forcing me to put on crampons for 5 minutes, then take them right back off to scramble up to and along the base of a large icefall. This traverse, a few minutes spent directly in the path of falling ice, is one reason this is no longer the standard route. 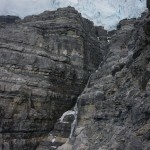 The most dangerous point occurs where one crosses the icefall’s outflow stream. After finding a suitable ledge on the other side, I quickly scampered to the small stream, crossed, and retreated on the ledge to a point where calving ice would at least bounce a few times before it hit me before relaxing. That wasn’t so bad. I continued up and left on more class 2-3 ledges and talus, eventually reaching a white-ish ridge leading to the base of the summit ice cap. Here there are two options: the standard route crosses the crevassed ice far to the right, joining the Kain route on its crest before returning left to the summit; an option preferable to the soloist, avoiding crevasse risk, climbs moderate snow and ice directly to the summit along the left-hand side of the cap. The clouds were hanging right above me, and I probably should have turned around. 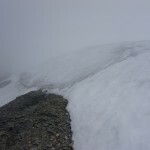 However, having come so far, I put on crampons, took out both tools, and climbed up and somewhat left, staying on the steeper left-hand side of a sort of crest. I climbed through a couple of steeper ice steps and some harder ice patches that required actual tool-swinging, but much of the climbing was moderate and sometimes even slushy. Seeing nothing more than 10-20 feet away, I eventually reached a point where the ridge to my right flattened out, and continued along the crest for a short distance. Anticipating that finding the correct descent would be tough, I was grateful each time I sunk into some slush, and sometimes scuffed my crampon or plunge-stepped to make a longer-lasting trail. I picked up an old boot-pack, following it to a local high-point, followed it to another, then retraced my steps to follow a different snow-crest to where it ended near an apparent cliff. I had hoped to find a cluster of flags, wands, or something telling me I was on the summit, but eventually gave up and returned to the first high-point, aware that visibility was decreasing, and my steps were fading. The climb had taken about 7 hours, but the hard part was just starting. Retracing my boot-path in the whiteout, I followed it at least far enough to start down the correct face, then lost it as I front-pointed down a steeper, harder slope. The wind had picked up, stinging my eyes with blown snow and sleet when I looked down. Knowing that I had to descent slightly climbers’ right — but not too far! — I tried to take a compromise line. I also tried to avoid too much time spent in the painfully slow process of downclimbing actual ice: crouch, free tool, swing, kick-kick, repeat. Looking below me, I saw that the slope appeared to drop off. After carefully getting closer to see what was happening, I saw that I was on the edge of a crevasse, and realized I had strayed right (climber’s right — I was facing in) onto the glacier. I climbed up and left past the impasse, then continued down and left. This process continued for perhaps two hours. I was fortunately warm enough, and was on terrain I could handle, but I knew I had to get down as far as possible, heading down and left as best I could with only local information. I also had to keep myself calm and cautious: keep three points of contact, make sure each tool stick is solid, remember to keep looking down. Once, after scrambling through a crevasse partly filled by an old avalanche, I was apparently stuck on some sort of island. I climbed back the way I had come, then headed up and right until I could make a reasonable but non-reversible jump down over one crevasse that allowed me to continue. I eventually reached an exposed ledge of black rock, and knew I was probably near the base of the ice, probably somewhere climber’s right of the ascent ridge. Heading toward the probable ridge, I climbed down and left over some more ice, then finally emerged on talus and ledges. A short way from here, I found whiter rock with a built-up bivy ledge, and gave an involuntary whoop! at being back on-route. Still unable to see more than 30 feet away, I traversed down and (skier’s) left, hoping to run into the icefall and its outlet stream. I first hit them too high, then retreated, descended, and returned a few times, passing the occasional bit of gear, before finding the crossing ledge I had used on the climb. After a final bit of wandering, I found the ice saddle, and was finally solidly back on-route. My mood improved considerably as I descended from clouds into light drizzle, boot-skiing the nice, wet scree where I could and carefully downclimbing the slabs and rotten shale where I had to. Passing the hut, I aimed for a large cairn at the center of the headwall below the hut rather than retracing my route along the ridge. From the cairn, bits of trail and cairns wound an improbable path down the headwall, ending in a short 4th-class chimney with a rappel anchor. I had apparently found the correct approach route. I followed a faint trail across the talus bowl, then found more bolts and two semi-helpful steel chains on the next step down. Finally traversing toward the descent ridge, I was shocked to meet two young men headed up to the hut, hoping to summit when the weather cleared in a couple of days. They seemed at least as surprised to see me, at first taking me for a dayhiker up to check out the hut. As I explained that I had probably summited, and was headed down that day, their opinion of me apparently changed from “tourist” to “crazy yahoo,” as one asked if I had a headlamp. Then they saw the two tools strapped to my pack, which apparently convinced them that I knew what I was doing. Brush-bashing back down the ridge, I got a Cascades-level soaking from the rain collected on trees and brush. 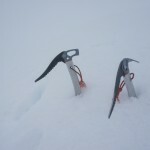 Though the hand lines had seemed silly on the way up, I found them extremely useful when descending the wet slabs. Finally reaching the trail, I turned on the last bit of NPR I had with me to pass the time while I trudged 5 kilometers to the trailhead. Uncharacteristically, I had filled out the duplicate climber search-and-rescue form in the morning, putting the first copy in the box. I dug the second out of my pack and, finding it surprisingly dry, wrote some comments before dropping it in the box, then curled up in the car with my damp gear. This entry was posted in Canada, Type II fun. Bookmark the permalink. What is this (below) that I find in the text?? Impressive work Sean! That was a day, even by your standards (which would make it 3 or 4 days for me)! You aren’t going to leave much left undone in Canada are you? Well done, lad! Thanks, Scott! Unfortunately, until I get a helicopter or hire a trail crew, there’s a lot up here I’ll just have to leave. It’s amazing how many wild and remote places there are up here. This coming from the guy who once tried to time his summit-tagging between lightning strikes? ;-) The icefall didn’t seem that bad: you’d have no chance if it calved while you were below it, but that’s only a few minutes, and chunks weren’t constantly falling off while I was up there. I noticed some fresh ice cubes on my way down, though. IMHO the tricky thing about Robson (and all the northern stuff) is that the weather is insanely variable year-round. Just glance at the awesome Robson webcam from time to time. I probably should have a GPS; it would have saved me some work on a couple of outings this summer. I was contemptuous of the discarded wands I saw on the rocks on the way up, but really wished I had been collecting and redeploying them higher up.